The science of treating gum disease is known as Periodontology. In most cases, gum treatment involves thorough, regular cleaning procedures carried out by a dentist or a dental hygienist. Occasionally, some individuals do not respond to conventional cleaning procedures and continue to experience pain, bleeding gums, bad breath, etc. In these cases, periodontal surgery may be indicated. Normally, you would have had 2-3 appointments to carry out deep cleaning procedures prior to considering surgery. However, if you are a suitable candidate for surgery, you will have a detailed consultation with our in house specialist. Following this, you will receive a comprehensive written treatment plan with specific advice tailored to your needs. You will get a clear idea of your duration of treatment and anticipated likelihood of success. You will also receive a detailed estimate of your anticipated treatment cost. On the day of the surgery, we take a lot of care to prepare a sterile environment before starting. This involves placing a sterile sheet on top of your clothes with the dentist and nurse wearing sterile gowns and gloves. This may remind you videos of surgical procedures you may have seen on TV. 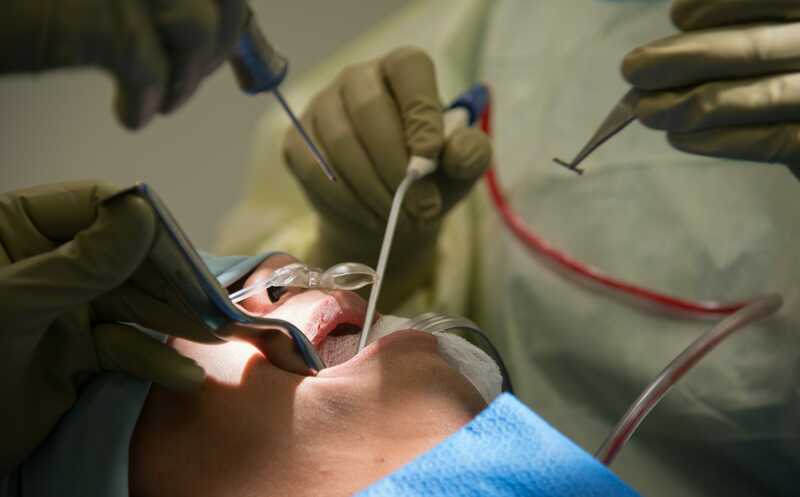 After you are profoundly numb (with local anaesthetic injections), a small cut (usually less than 1-2 cm) is made in your gum and the area is thoroughly cleaned. If you have lost bone around the tooth, you will have a bone regeneration material placed and your gum will be stitched back. It is normal to experience minor discomfort and swelling for a few days following surgery. Simple painkillers, regular mouthwash and ice application following surgery will help minimize any discomfort. You will be reviewed 1-2 weeks later to remove any stitches and carry out an initial assessment of the outcome of treatment.